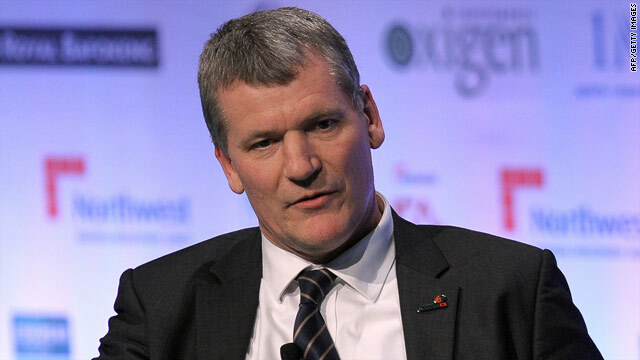 Manchester United chief executive David Gill is unworried by the three-time European champions' record deficit. (CNN) -- Manchester United's financial state was thrown into stark relief on Thursday after the English club's American owners revealed a record loss of $137 million despite making an unprecedented operating profit of $160 million. The disparity of figures is largely caused by interest payments of $67 million and a one-off cost of $107 million relating to the Premier League outfit's bond scheme, launched in January to help restructure the debts accrued by the Glazer family in purchasing the 18-time English champions in 2005. The club produced a record turnover of $455 million for the year ended June 2010, more than double that of local rivals Manchester City, but suffered a big swing from last year's profit of $77 million -- which was largely due to the world-record $130 million sale of Cristiano Ronaldo to Real Madrid. However, United chief executive David Gill insisted that the Glazers were not in the same position as fellow Americans Tom Hicks and George Gillett, who have been forced to sell Liverpool due to debts incurred in buying the now ailing five-time European champions. "We are not a club that needs to sell. We have money in the bank so there is zero pressure on that, no pressure at all to sell any star player whether it is Wayne Rooney or X, Y or Z. I can categorically say that," Gill told the UK Press Association. "There was no desire at all from anyone at the club to sell Cristiano -- he wanted to go, and as a result we managed to extract a world-record fee. The philosophy is to retain and attract the best players. We have £165 million (£260 million) in the bank, but in some ways we would prefer to have £80 million in the bank and Ronaldo on the pitch." Gill was heartened by figures such as those showing that the club has the lowest wages-turnover ratio in the Premier League of 46%, despite player salaries rising from $195 million to $210 million. By comparison, Premier League champions Chelsea's wage bill was last reported at $226 million, Manchester City's is $212 million and Arsenal's $175 million. "There are very good results for the club with records here, there and everywhere but they are complicated with non-cash items and exceptional one-off hits," Gill said. "The United fans should not be concerned. We have a long-term financing structure in place, excellent revenues that are growing, we are controlling our costs and we can afford the interest on our long-term finance. "In our opinion, if something changed in the ownership, this club will survive and continue -- it is covering the financing cost more than adequately. We still have cash to invest in players and to give good contracts to players, and we are comfortable with the business model." While United's overall debt has risen to $830 million, the accounts revealed that the Glazers did not take out any money from the club to service their high-interest payment-in-kind loans of $318 million. United's media revenues rose to $167 million but match-day income fell to $160 million, reflecting moves by supporters' clubs to undermine the Glazers by boycotting games. The Premier League on Friday confirmed that Liverpool's prospective new owners, New England Sports Ventures, have passed the ruling body's criteria. However, NESV -- who own the Boston Red Sox baseball team -- face a court battle with Hicks and Gillett, who are trying to block the sale agreed by Liverpool's board this week. Meanwhile, veteran Manchester United goalkeeper Edwin van der Sar has denied reports claiming that he has decided to retire at the end of this season. "That's complete nonsense. I don't yet know whether I will stop or continue after this season. Only in the course of this season will I think about it. Then I will decide and not before. For now I keep my focus on United," the 39-year-old Dutchman told website www.sport-promotion.nl.